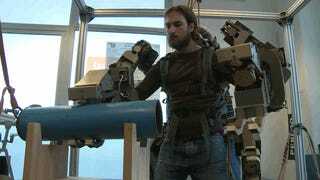 Italian engineers have developed a wearable robot that allows operators to to lift up to 110 pounds (50kg) in each extended hand. Developed by Perceptual Robotics Laboratory (Percro) at Pisa's Scuola Superiore Sant'Anna, it could eventually be used for work in factories or to clear debris and rescue survivors in earthquake zones. The "body extender" is one of many being developed around the world for manufacturing, therapeutic and military purposes.